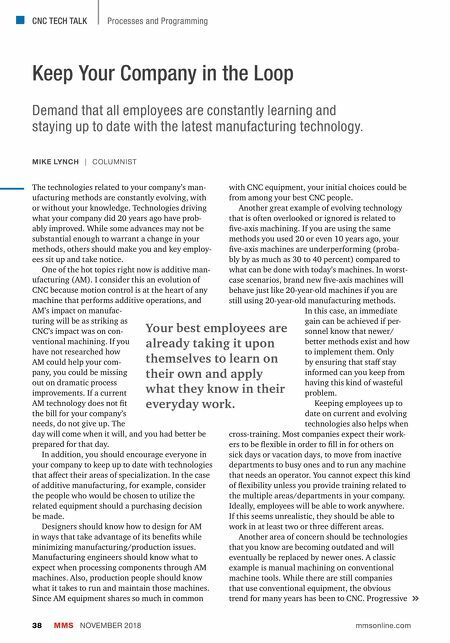 CNC TECH TALK MMS NOVEMBER 2018 38 mmsonline.com Processes and Programming Keep Your Company in the Loop MIKE LYNCH | COLUMNIST Demand that all employees are constantly learning and staying up to date with the latest manufacturing technology. The technologies related to your company's man- ufacturing methods are constantly evolving, with or without your knowledge. Technologies driving what your company did 20 years ago have prob- ably improved. While some advances may not be substantial enough to warrant a change in your methods, others should make you and key employ- ees sit up and take notice. One of the hot topics right now is additive man- ufacturing (AM). I consider this an evolution of CNC because motion control is at the heart of any machine that performs additive operations, and AM's impact on manufac- turing will be as striking as CNC's impact was on con- ventional machining. If you have not researched how AM could help your com- pany, you could be missing out on dramatic process improvements. If a current AM technology does not fit the bill for your company's needs, do not give up. The day will come when it will, and you had better be prepared for that day. In addition, you should encourage everyone in your company to keep up to date with technologies that affect their areas of specialization. In the case of additive manufacturing, for example, consider the people who would be chosen to utilize the related equipment should a purchasing decision be made. Designers should know how to design for AM in ways that take advantage of its benefits while minimizing manufacturing/production issues. Manufacturing engineers should know what to expect when processing components through AM machines. Also, production people should know what it takes to run and maintain those machines. Since AM equipment shares so much in common with CNC equipment, your initial choices could be from among your best CNC people. Another great example of evolving technology that is often overlooked or ignored is related to five-axis machining. If you are using the same methods you used 20 or even 10 years ago, your five-axis machines are underperforming (proba- bly by as much as 30 to 40 percent) compared to what can be done with today's machines. 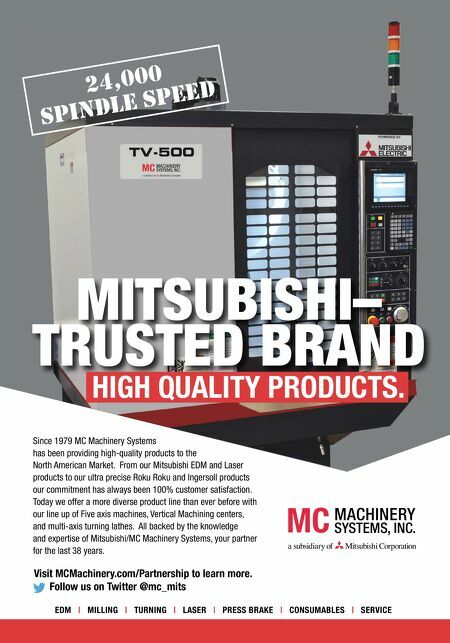 In worst- case scenarios, brand new five-axis machines will behave just like 20-year-old machines if you are still using 20-year-old manufacturing methods. In this case, an immediate gain can be achieved if per- sonnel know that newer/ better methods exist and how to implement them. Only by ensuring that staff stay informed can you keep from having this kind of wasteful problem. Keeping employees up to date on current and evolving technologies also helps when cross-training. Most companies expect their work- ers to be flexible in order to fill in for others on sick days or vacation days, to move from inactive departments to busy ones and to run any machine that needs an operator. You cannot expect this kind of flexibility unless you provide training related to the multiple areas/departments in your company. Ideally, employees will be able to work anywhere. If this seems unrealistic, they should be able to work in at least two or three different areas. Another area of concern should be technologies that you know are becoming outdated and will eventually be replaced by newer ones. A classic example is manual machining on conventional machine tools. While there are still companies that use conventional equipment, the obvious trend for many years has been to CNC. Progressive Your best employees are already taking it upon themselves to learn on their own and apply what they know in their everyday work.